December 6, 2011. Irvine, CA. Cybernet, the pioneer in all-in-one PC technology, has just launched the next all-in-one medical PC in their CyberMed series: the CyberMed G45. Earlier in 2011, the CyberMed MP15T made a big splash in the medical computer market. This new 19-inch CyberMed G45 model has an Intel G45 chipset for exceptional power and performance to handle EMR applications and to view x-rays and other medical images. Since 1996, Cybernet has been the pioneer in all-in-one computers. 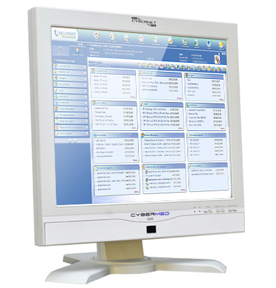 Their all-in-one PCs are ideal for medical environments because they are medically certified, have an antimicrobial coating, and can be mounted on walls or medical carts. Today’s health care facilities require powerful PC technology to run applications for patient care, electronic medical records (EMR), hospital administration and laboratory/radiology analysis. Cybernet’s all-in-one PCs deliver the performance and reliability needed, in space saving packages. The new CyberMed G45 is touch screen ready, is EN60601-1 medically-certified and has an antimicrobial coating, so it is ideal for use in hospitals and other medical facilities. Its powerful Intel Core 2 Duo E5500 CPU, Intel G45 chipset and up to 8GB of DDR3 memory can handle complex EMR applications with ease. The graphics capability of the Intel G45 chipset and the 19-inch display enable detailed viewing of medical images.